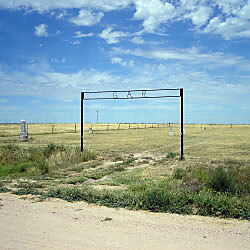 Description: A GAR burial ground is marked with a welded pipe entryway. There are approximately fifteen individual stones marking the burial plots for GAR members and their families. 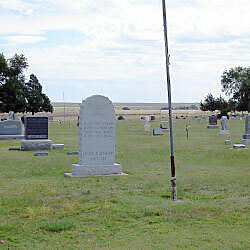 Description: A granite marker in the center of the city cemetery is inscribed: "Let Us Hold In Sacred ~ Memory All Those Who ~ Served Their Country ~ In Time Of Need ~ Legion & Auxiliary ~ Post 137". There are a few Civil War headstones in the cemetery. Description: Two granite plaques are mounted at the entrance to the City Hall. The plaque on the left reads: "This ~ Cheyenne County Memorial ~ is Dedicated to Honor the Memory ~ of all Armed Forces Who Served ~ Our Country ~ World War I World War II ~ Korean Vietnam ~ Panama Grenada ~ Persian Gulf". The plaque on the right reads: "G.A.R. ~ Post 412 ~ V.F.W. 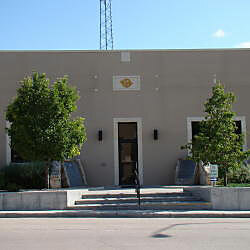 ~ Post 1528 ~ American Legion ~ Post 137 ~ Ladies Auxiliary ~ Post 1528".